Wireless connectivity and wireless mobility has become a way of life. Today most everyone is carrying a mobile device and expects to have high speed wireless bandwidth everywhere they go. In many cases, people now have more than one wireless device carrying around their smart phone and their tablet device (e.g. iPad). A major problem in the wireless industry is when wireless networks get overloaded due to the high density of users on a local network. This problem becomes even greater when you have events that have thousands of people all trying to get online with their wireless devices all at the same time. Cellular networks can get slammed. This is why many carriers try and off load people onto Wi-Fi hotspots in order to free up the demand for their 3G / 4G networks. A rule of thumb is to have a max capacity of 40 active Wi-Fi users on an access point at any given time. Now many manufactures have pushed that limit by using various techniques like timing algorithms, but as a general rule for high performance 40 is a good number. In high density wireless applications the thing to remember is that even if everyone is not trying to use their wireless handheld device, the devices still beacon the network. This causes a lot of traffic and overhead to an access point. So what happens when you put thousands of people in a small area all trying to get a wireless Ethernet bridge using Wi-Fi connectivity? If you do the math you would have to add a lot of wireless access points in an area to handle the load. With Wi-Fi 802.11b/g 2.4GHz there are only three non-overlapping channels. In Wi-Fi 802.11a there are 8+ depending on the channel widths. Most all devices will try and use the 2.4GHz 802.11b/g Wi-Fi first by default. With only three non overlapping channels it becomes difficult to put a lot of AP’s next to each other in a small place, especially if the AP’s are using omni directional antennas. You have to do strict channel and power planning. Recently, we were asked to provide Wi-Fi for over 3000 users in an area of 100ft x 500ft for an outdoor high profile event party for SXSW. We were able to not only provide Wi-Fi for that many users but where able to provide high speed seemly roaming without any problems. How did we do it? First, we brought in a 300Mbps full duplex wireless backhaul to the event from a location across town using microwave communication. We didn’t have direct line of sight so we used a rooftop to create a wireless repeater. We did a point to point wireless shot from the main building to the wireless repeater and then another point to point wireless bridge down to the outdoor event. We used 24GHz SAF Tehnika Lumina radios for the microwave communication. For the Wi-Fi at the event we choose to use a Wi-Fi array system by Xirrus. 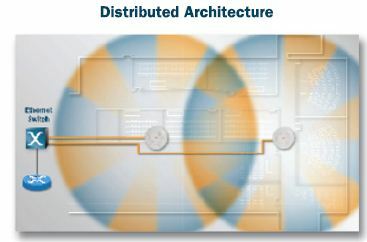 Xirrus arrays use multiple AP’s with sector antennas to distribute the Wi-Fi signals much like a cellular site design. This allows for greater output and better RF channel control. With the Xirrus system we were also able to force devices that had 802.11a 5GHz capability onto a 5GHz AP to free up the demand of the 802.11b/g 2,4GHz AP’s. Each Xirrus array has its own built in controller which communicates with every other array in the system. This was very effective and saved on costs of having to have an expensive traditional Wi-Fi controller on site. We weren’t able to cable each array directly so in some cases we used a millimeter wave solution to create a wireless Ethernet bridge between arrays. The crowd loved it and it was amazing to be able to have wireless roaming capability on my iPad while Skyping my wife who couldn’t attend the event! Is there still value in deploying a city wide outdoor wireless Wi-Fi network? Every day there the number of people that use mobile devices that are Wi-Fi enabled continues to grow. The demand for high speed connectivity to the internet is in high demand. So there is definitely a business case for it. Many cities have tried a wireless installation to provide complete city wide Wi-Fi connectivity and have failed. In many cases the city governments, that have no staff trained and experienced in outdoor wireless backhaul and outdoor Wi-Fi systems, that tried to deploy the outdoor Wi-Fi technology rather than an outdoor wireless backhaul or mobile carrier provider, that does have experience and knowledge in mass deployments of RF and microwave communications. Three major reasons why many of the outdoor Wi-Fi attempts failed are because there was no clear business model, projects were attempted without using highly skilled outdoor wireless installation and wireless engineering integrators, and a complete lack of understanding in the costs associated with deploying and maintaining an outdoor Wi-Fi system. Technically, it is very difficult to deploy the amount of wireless access points needed to provide complete RF coverage without causing self wireless interference. It can be done but so often wireless engineering was an afterthought when it should have been the first step. On the other hand, WiMax backhaul promises high speed wireless connectivity to mobile devices and has already been deployed around the world with great success. WiMax backhaul, as a standard, was originally designed for outdoor wireless connectivity where Wi-Fi is a standard for indoor wireless connectivity. WiMax can cover much farther distances, requires much less infrastructure, is cheaper to deploy, wireless installation is easier, and is more cost effective to maintain. The problem is that there are not a lot of devices that are equipped with WiMax chipsets yet. Over the years, there have been a lot of quality wireless manufactures that have come to market with outdoor wireless communication products for either outdoor Wi-Fi or WiMax solutions. Companies like Xirrus (who probably has the strongest outdoor Wi-Fi solution) and BelAir Networks have great solutions for outdoor Wi-Fi deployments. There are many others like Proxim, Motorola, and Aruba to name a few that have outdoor Wi-Fi solutions too. Companies like Alvarion, Motorola, Proxim, and Solectek to name a few make WiMax backhaul base stations and subscribers. For the 2012 Olympics, London has declared that they will have a city wide outdoor Wi-Fi network. The services will not be offered for free but will allow tourists to stay connected to the world during the games. It is unclear who will be responsible for deploying the Wi-Fi network and who will maintain it after the Olympics. Will the City of London sell the network to an internet provider or mobile carrier or will they become a large WISP themselves. The hopes is that they will have a solid business model and will have the network designed and the wireless installation done by a credible wireless integrator. The one thing for sure is that both WiMax backhaul and outdoor Wi-Fi technology will provide a lot of benefit to the users of mobile wireless connectivity.